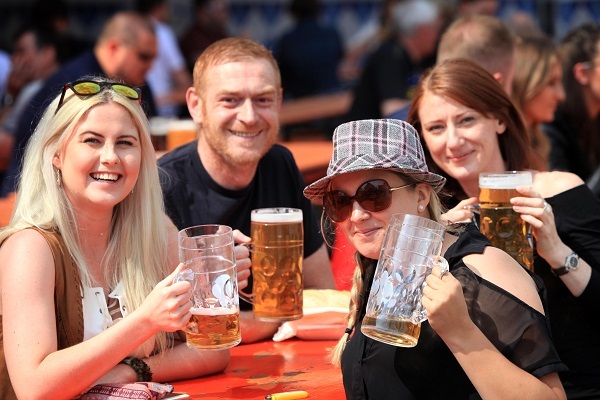 Oktoberfest is coming to Bristol’s Millennium Square on September 1st to 4th (read more about it here)…and we have tickets to give away to one lucky winner! Bristol Bites has teamed up with Bristol Oktoberfest to offer one lucky winner a pair of tickets for Sunday, September 4th. The tickets include seat reservation in the Oktoberfest party tent as well as complementary food and drink on the day – what’s not to love?! To enter, simply leave a comment below letting us know about your past Oktoberfest experiences (or, if you’ve never been, what you’d most look forward to at Bristol Oktoberfest if chosen as the winner. You must be 18 or over to enter, and the competition closes at midnight on Sunday, August 21st. Good luck! Entrance to Bristol Oktoberfest is free on Thursday and Sunday, £5 on Friday and £6 on Saturday. For tickets, visit bristol-oktoberfest.co.uk or email info@bristol-oktoberfest.co.uk or call 020 3239 1408. Wunderbar! 11 Responses to Win a pair of tickets to Bristol’s Oktoberfest! Oh God – the last time I got insanely drunk, ate abut 6 giant pretzels with some strange cheese sauce, made friends with a stag party and ran off in one of their banana outfits. My wife picked my up and I was sick in the back of her car. I’ve not been to an Oktoberfest before, let alone one in Bristol. I’m looking forward to trying some weissbiers and, hopefully, some authentic currywurst. I’ve been to an Octoberfest in Berlin and London; both provided awesome beer, music and food! I can’t wait to get together with friends and family at a Bristol based event. I have not been to Bavaria, but I have celebrated this much-loved event in Bristol in the past and it is always fantastic! Great beer, tasty food and happy-inducing music to sway and dance to. Prost! I’ve been to Germany a few times but never at the right time. A few work colleagues have had the Bristol experience but I’m yet to indulge; this year will probably be the one! I’ve not been before but would love to give it a go – what’s not to like? Good food with good drink and what promises to be a great atmosphere! Never been before, but looking forward to trying EVERY SINGLE BEER. I’ve never been, but would love to surprise my partner with tickets, he loves beer and it would be a fabulous day out!